Core Blocks™ are a true all round solution. A tuned 2-stage bearing system provides excellent performance across the full working load range with an integrated thrust bearing feature and the resilience to handle high dynamic or static loads. 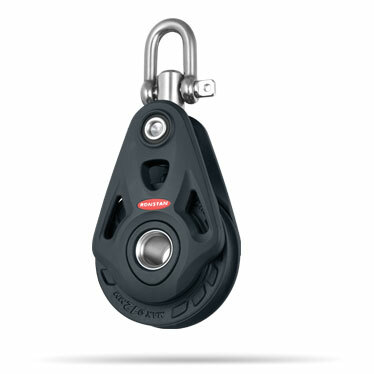 Acetal sheave, alloy cheeks and stainless fixings complete the durable package. For reliability and a long service life, these blocks are the right choice for sheets, halyards and control line applications for cruising and racing. Stage 1 - Under moderate loads, Acetal ball bearings ensure minimum friction. Stage 2 - Under heavy loads, where deformation of ball bearings alone would result in increased friction, a sliding Acetal bearing on a polished stainless steel race takes over, maintaining low friction performance. Additionally the ball bearings are configured to act as a thrust bearing between the sheave and cheeks, preventing the sheave from rubbing on the cheeks and causing friction when the line lead in and out of the block isn’t perfect. Particularly important for cheek blocks. Block cheeks are manufactured from the highest quality alloy for maximum strength. Material optimisation and the cut-away design minimises weight and allows easy fresh water rinsing of salt and debris from the bearings. Cheek design has been further styled with flaring at the block throat and reduced gap between the cheek and sheave, minimising rope wear. Ideal for mainsheet, halyard and spinnaker sheet applications on boats to 10m (33ft). Various control line applications on larger yachts. Alloy sheave models are available for use with wire.